Company Profile ｜ Company Profile of UTSU Co., Ltd., a trading company specializing in chemical products. Company Profile ｜ Information about the company profile of UTSU Co., Ltd., a trading company specializing in chemical products. Our Company, founded in 1916, is in its 103rd year and have celebrated our centenary in business. During our history that spans a century, first and foremost we have sought to build a relationship of trust with our customers and have dedicated ourselves to encourage and develop this relationship. We have adopted the slogans of firstly, making proposals that preempt the needs of the times; and secondly, offering adaptable services to our customers. We recognize that it is the job of a trading company to be able to adapt to changing circumstances. In addition, we are a trading company that specializes in industrial chemicals. Chemistry is a field full of the latest technologies that are constantly evolving. We accumulate and update to our customer with the latest information of their field.We promise to our customer that the information we shared with contribute to their success. It is only natural that we should develop our business beyond international borders. Irrespective of national and regional boundaries, we are eager to expand our business to partners all over the world to contribute in expanding their own enterprises in turn. We will continue to meet all expectations. While adaptively coping with new issues, we will place priority on our traditions and customer trust. We will never lose the attitude of wanting to play our part to help our customers. I sincerely hope that you will continue to give our 100-year-young Company your guidance and encouragement. 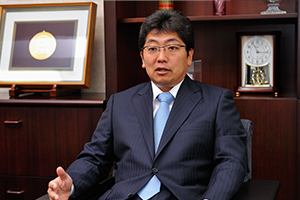 ・Tokyo Small and Medium Business Investment and Consultation Co., Ltd. Copyright © 2016 UTSU Co., Ltd. All Rights Reserved.